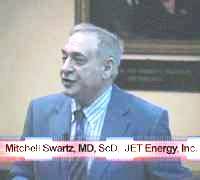 Dr. (scientific and medical) Mitchell Swartz is the founder and present director of Jet Thermal Products. He is the founder and chief editor of Cold Fusion Times, and responsible for organizing a number of cold fusion conferences at MIT, spanning at least from 1991-2005, including one that was dedicated to honoring the memory of Dr. Eugene Mallove, a cold fusion champion who was murdered. He +is an inventor with several patents and journal publications. He has had extraordinary experiences with at least one company over his licensed invention, besides many Patent Office horror stories. He was denied a hearing at the Supreme Court level for a calorimeter patent application on appeal. Swartz received his BS, MS, and EE degrees in Electrical Engineering from Massachusetts Institute of Technology (MIT, 1971). He earned a Doctorate in Medicine from Harvard in 1978, and a Doctorate in Science (ScD) from MIT in 1984. His specialties include the interaction of radiation and matter, materials, antennae, phototherapies involving electron transfer, high dose multifractionated photoradiotherapy, biological-semiconductor sensors, and positron emission tomography. His clinical interests are radiation oncology and biomedical engineering, diagnostic and treatment devices, and the development of artificial internal organs and therapy systems powered by LANR. The 2005 MIT Cold Fusion Colloquium, Honoring Eugene Mallove by Scott Chubb, Infinite Energy, #62, pp. 8-14 (Jul/Aug 2005).